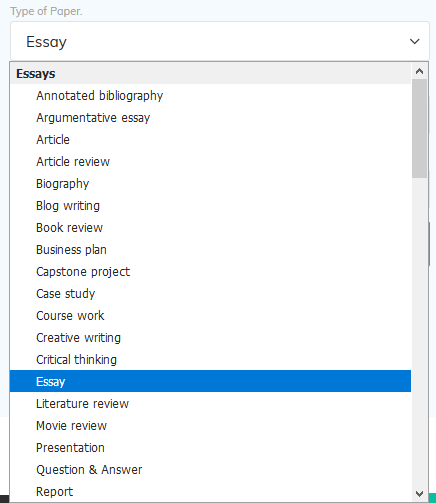 Quoting a custom essay writing service that can provide you with high-quality academic content from prices as low as $9.97, it’s no wonder than Affordable-Papers.net may have caught your eye as your writing service of choice. However, with such a broad range of services out there to choose from, it’s important to make sure you pick the one that’s right for you. Today, we’re going to explore the ins and outs of Affordable-Papers and whether this is the service you’ve been looking for. While there is an obvious lapse of a services page to be found anywhere on the website, you’ll have to use the order form drop-down menu to see whether the service you’re looking for is catered. However, there is around 30+ services listed here with all the basics you’d expect. These range from standard essays and dissertations to more niche services like PowerPoint presentations and even speeches. While there is a broad range available, it’s worth noting that the leading sites can offer up to 50+ services, so there are some obvious absences. You can use either the pricing page or the order form on the homepage to figure out how much your writing assignment is going to cost. Affordable-Papers.net offers a price-per-page system that’s based on the academic level you need, the deadline and the type of paper. To give you a rough idea on what the pricing is like, a ten-page essay written to a Bachelor’s level with a 5-day deadline will set you back around $230. This is quite a bit of money, a lot more than some of the other writing services available and may not be suitable for a student on a tight budget. Of course, the quality of the content you’re paying for (with such high prices) is of the utmost importance when it comes to getting the grades you deserve. While there is a testimonials page, these provide no information as to the quality of the content and seem illegitimate as they have no writer name or rating system. Searching online, the reviews are also fairly unfavorable. The average rating is 1-star out of five and claims poor customer service, really poorly written content and low grades for some of the submitted pieces. As we mentioned above, with the poor quality of the content aside, the customer service again lets the service down. The refund process seems to take forever and there’s never anybody around when you want to talk about a problem or request an edit to your order. All in all, Affordable-Papers.net leaves a lot to be desired. While the service looks good, the pricing system is no different to the majority of custom essay writing services, the content is below average and the customer service experience is dire; so bear this all in min before placing an order. Horrible experience. The writer didn’t follow the guidelines, and about 50% of the content is gibberish and repeated sentences. I bought a 5 page essay for $165, and received trash which I have to salvage somehow. Not worth it all, avoid this site.